About Mark: My community is important to me. That's one of the reasons I am dedicated to various organizations and activities within our area. Staying involved in the community helps me build stronger relationships with all of my neighbors. The people in our area are my family, regardless of whether or not we're actually related. Each person in the neighborhood is unique and I love hearing their stories. Our community is my home. It's where I work. It's where I relax. Just like you, I understand its distinctive qualities, which allows me to serve my neighbors and provide the best in financial security. I bet I can help you, too. Please feel free to contact me directly by phone or by completing the Contact Me form on my site. I hope to see you around soon! 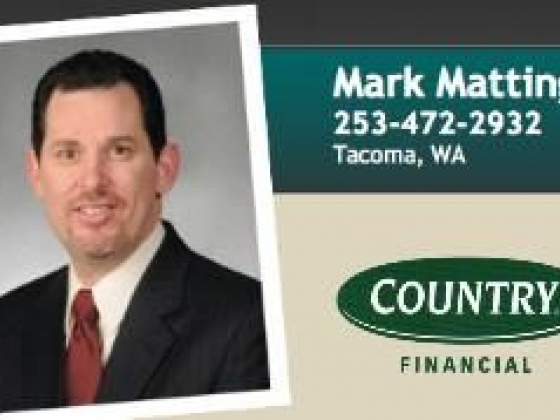 EXPERIENCE Have been with COUNTRY for 2 years LICENSES/CERTIFICATIONS/DESIGNATIONS Licensed in WA COMMUNITY INVOLVEMENT Mesa Chamber of Commerce Member Mesa Chamber of Commerce Ambassador Why Meet with Me I can help secure your future with a complimentary insurance and financial review. Unless you're an expert in every aspect of your financial affairs, there may well be gaps and weaknesses in your long-term plans for financial security. Put simply, what you don't know or understand about your financial affairs can end up hurting you and your family. That's why it makes sense to sit down with me and complete your confidential insurance and financial review. With the right help, almost any family can achieve financial security. Whether you are my client or not, an insurance and financial review will help secure your future. If we haven’t met before, the first meeting will simply allow you to learn more about our services and get to know me and the company I represent. I will also walk you through the information we'll need to create a tangible plan that clearly shows you how we’ll help you get from where you are today to where you want to be in the future. If you have met with me before, taking a fresh look at your situation each year may reveal some gaps or new opportunities you can take advantage of. Download our Insurance and Financial Review checklist for a complete listing of items to bring with you to the review. Is meeting with me the right step for YOU right now? Some people feel their financial affairs are in pretty good shape, and wonder whether it is worth their time to meet with me. Others feel that their situation is in a bit of a "mess", and hesitate to share their information with anyone outside their family. Either way, there is nothing to lose by sitting down with a trained expert for a confidential, in-depth review - whether you have met with me before or not. Your meeting with me could prove to be the smartest thing you ever do to ensure your family's financial security. Backed by a team of experts When you work with me, you get a one-on-one relationship and the added support of a team of experts. I get to know you and your family, and can clearly communicate your needs while working with a team of specialists to prepare a plan that meets your goals. Essentially, you get personal service and the comprehensive professional expertise you need to prepare for whatever the future brings your way. Contact me for a complimentary insurance and financial review today. Policies issued by COUNTRY Life Insurance Company®, COUNTRY Investors Life Assurance Company®. COUNTRY Mutual Insurance Company®, COUNTRY Casualty Insurance Company®, and COUNTRY Preferred Insurance Company®, Bloomington, IL. Coverage not available in all states. Read our full disclaimer. This information is for general use only and shall not be construed or relied upon as an offer of employment, express or implied, under any circumstances. All terms are "at will" and are controlled by the official policies of the organization and by applicable laws and regulations. Mon - Fri 9am - 5pm Evening and Weekend appointments available. So I needed a windshield replaced and since my husband is in Afghanistan he could not set it up. I had no idea what to do but made one phone call to Country Financial and they not only got the claim started but transferred me to Safelite so I could set up my appointment so incredibly easy. Thanks Mark for all you do!!! Mark, was wonderful to work with. He ended up saving me over $200/yr on my business ins. He also took the time to review all of our personal insurances to make sure we were covered correctly and getting the best price!! I totally appreciated all his time/effort he put into working with me,. Can't wait to sit down with him and talk financial planning. We were searching for guidance on proceeding forward on insurance issues as life continually changes. Mark took the time to walk us through our concerns and questions in a very personal and profession manner. He listens and then develops several options to establish a program that would fit our specific needs. He has access to a lot of options and takes the time to explain everything so intelligent decisions can be made about future needs. We highly recommend his services.